Here is where you’ll find anything and everything you ever wanted to know about Bacon. So for all you new readers, and those of you here from Bacon: The Beginning, here is all you ever needed to know about Bacon. My cats like to play with him. 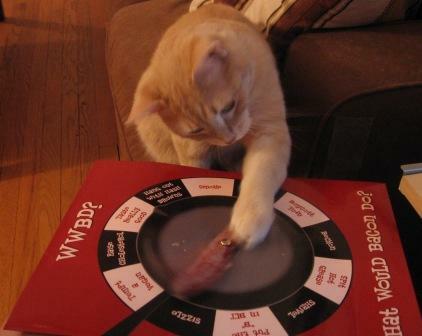 Here Simba gives the Bacon spinner a twirl. Bacon does not like to play back. 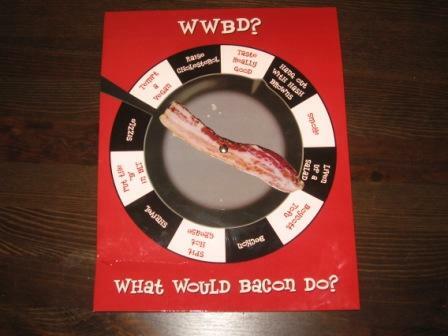 And then I spin the Bacon spinner and I get my answer. At some point, I decided that I got really crazy search terms through Google for people stumbling on my blog, search terms that I couldn’t even answer, so I turned to Bacon. And Bacon Says was born. Sometimes he’ll even answer questions from his devoted following. Lately he’s been getting to go on fun trips to Vegas and San Francisco and meeting all his adoring fans. Click HERE for all the links to the Bacon posts. Bacon has 12 possible answers, answers that can solve any problem. One spin of the wheel and one of the following answers will help lead you to a fulfilling life. And that concludes your Bacon lesson. I’m Jewish, but not religious. The other day, my coworker was miffed at having to stagger her start time because she had a late meeting, and asked me what she should do since she wakes up at 7:30 at the latest anyways. I told her to make herself eggs benedict. And bacon. Lots and lots of bacon. Because bacon makes everything better. This is ingenious! I never thought of living my life the way Bacon would want me to. It just makes so much sense!